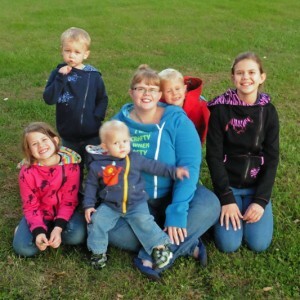 2015 Hoodie Blog Tour Round-up + My Kids’ Hoodies – Everything Your Mama Made & More! The last of the 2015 Hoodie Tour stops were officially yesterday, but guess what?!? Kymy extended the coupon code until tonight. 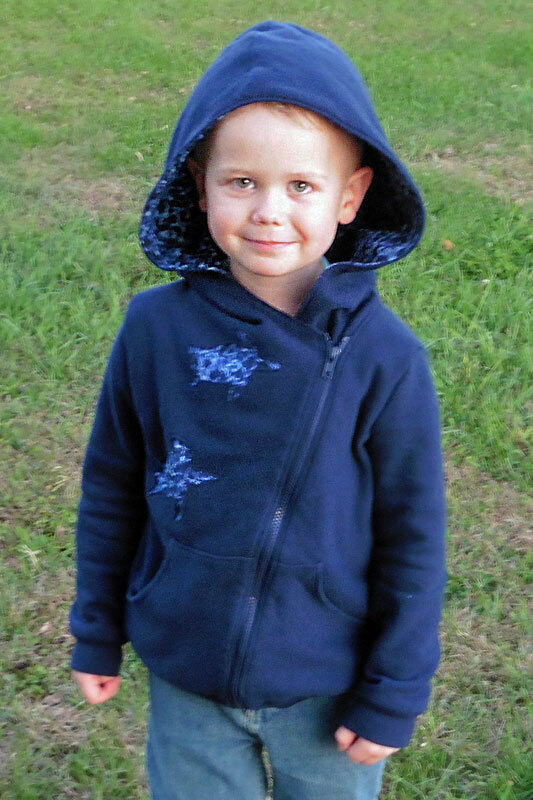 Use code FALLHOODIES2015 to save 50% on either the Zander’s Hoodie & Hooded Vest (newborn-18tween) or His & Hers Hoodie & Hooded Vest (adult XS-5XL) and expires 11:59pm PST on Sept. 30. Hooray! 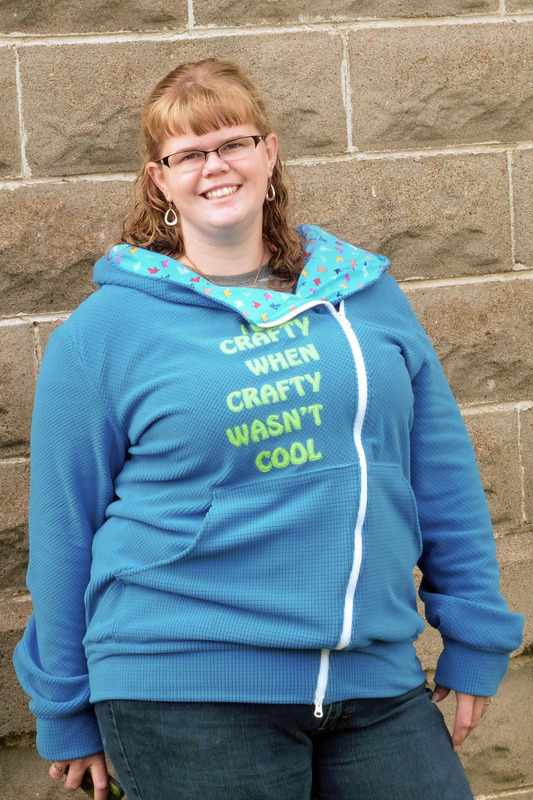 It was my goal to finish my older kids’ hoodies by the end of the tour and I got done just in the nick of time! 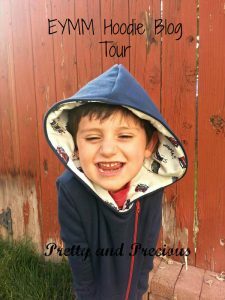 Now all 5 of my children have their own beautiful Zander’s Hoodies … and four of them were sewn since the blog tour started!! 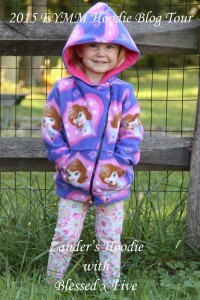 It was fun to work with each of my big kids to pick what fabrics and embellishments to use for their hoodies. 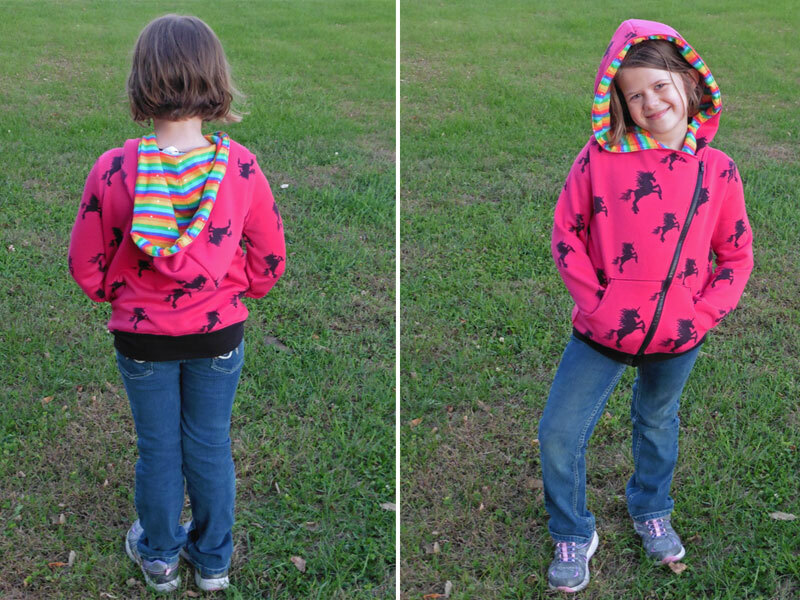 My oldest girl, of course, chose her favorite pink zebra print from Girl Charlee and black sweatshirt fleece from JoAnn Fabrics. 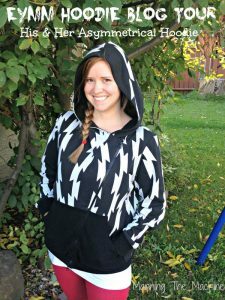 We searched online for some zebra outlines and I used them to do some reverse applique on her hoodie. 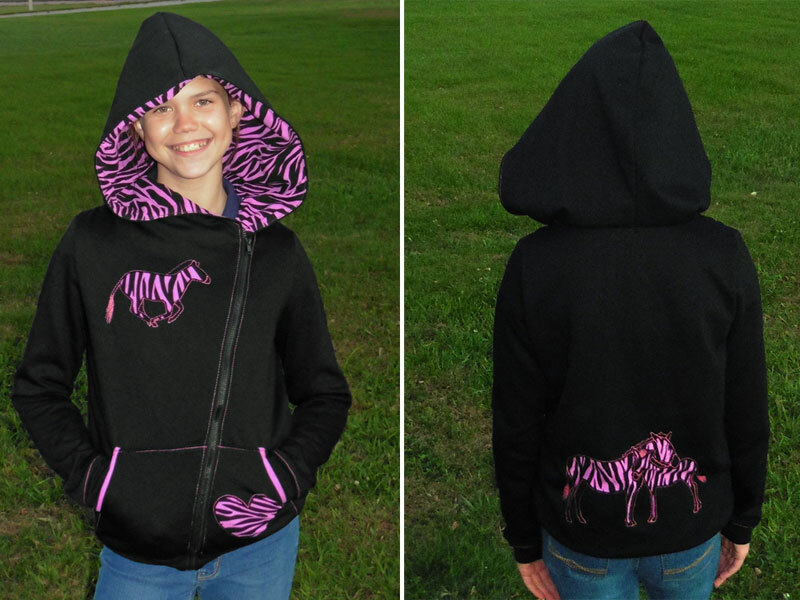 We put the mama/baby zebra low on the back so that the hood wouldn’t cover them when it was down. I also added a running zebra on the chest, a heart reverse applique to one pocket, and used pink cotton spandex to bind the pocket edges to make them pop a little. Pink topstitching was the perfect finishing touch! Her little sister had long ago fallen in love with these rainbow stripes I scored in a flawed lot from Peek-a-Boo’s Fabric Shop. 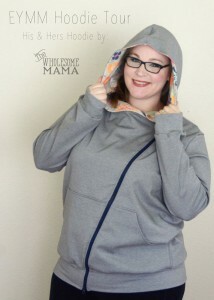 When I saw Purple Seamstress list the hot pink sweatshirt fleece with black unicorns a couple weeks ago, I knew it would be a fabulous match for the stripes she already loved! 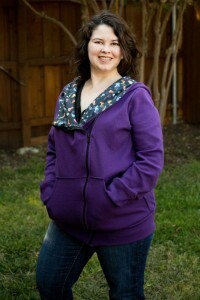 Of all the Zander’s Hoodies I’ve made, this one came together the quickest because I didn’t do any extra embellishment. Lucky for me! Haha! 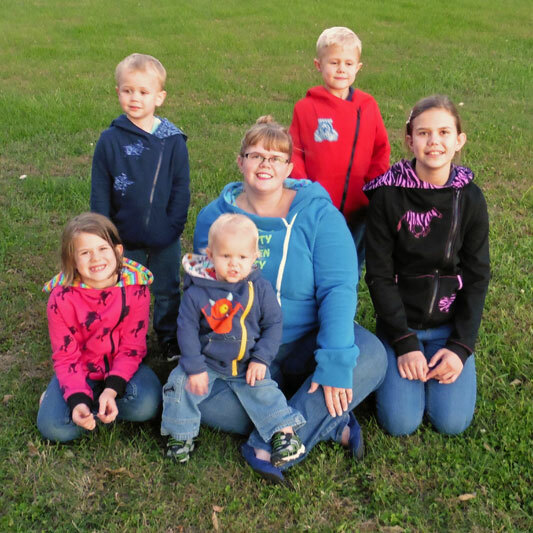 When I asked my oldest son what kind of hoodie he wanted, he told me Spiderman. I had recently found a pair of knit boxers on the clearance rack with Spidey on them, so knew I could upcycle them to applique on his hoodie. I simply put it in place, pinned well, and sewed around the outline with a triple stretch stich before carefully trimming the extra fabric down to about 1/8 inch around Spiderman and the “Brave” design on the front. Then I took a fabric marker and drew in the “web” rope that Spidey was swinging from, making it disappear into the back neckline. 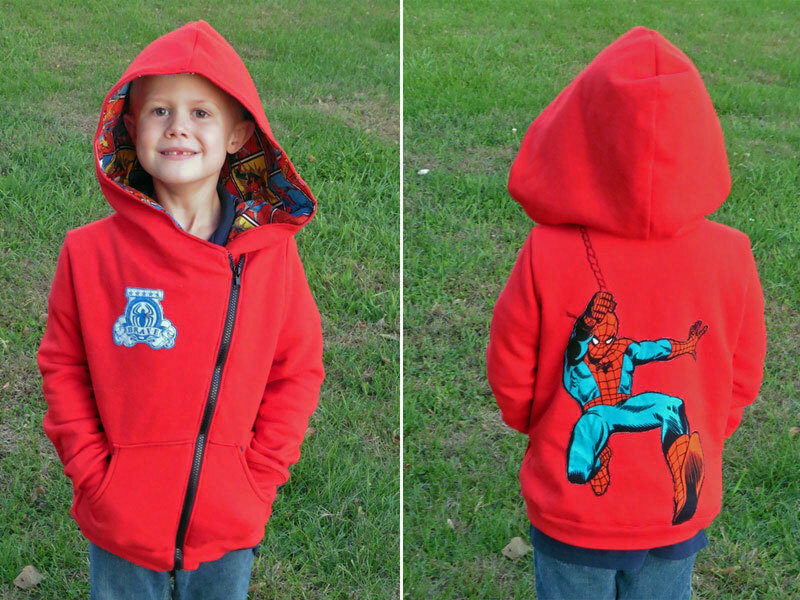 I looked briefly and didn’t find a solely-Spiderman knit, so we settled for lining his hoodie with cotton woven. It works okay since the hoodie is a loose fit and the sleeves aren’t lined, but I had to be very careful when sewing the hoodie to lining that I didn’t stretch the outer red sweatshirt fleece. Speaking of, the red is actually upcycled from a man-sized sweatshirt and sweatpants (I think they were both around 3xl size). I cut the pieces with the integrated hood attached from the pants because they’re tall pieces and cut the sleeves, small front piece, and back from the sweatshirt. I took advantage of the original sleeves’ ribbed cuffs by placing the hoodie sleeve pattern so the bottom seam allowance was on the original cuff seam (meaning the bottom 3/8 inch of sleeve pattern was on the ribbed cuff). 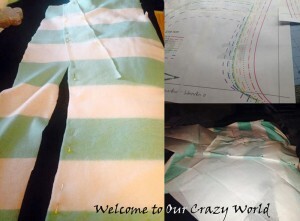 That saved me having to sew the cuffs on later! I also re-used the bottom ribbing from the original shirt, cutting it to the length and angled ends of the bottom band pattern piece. 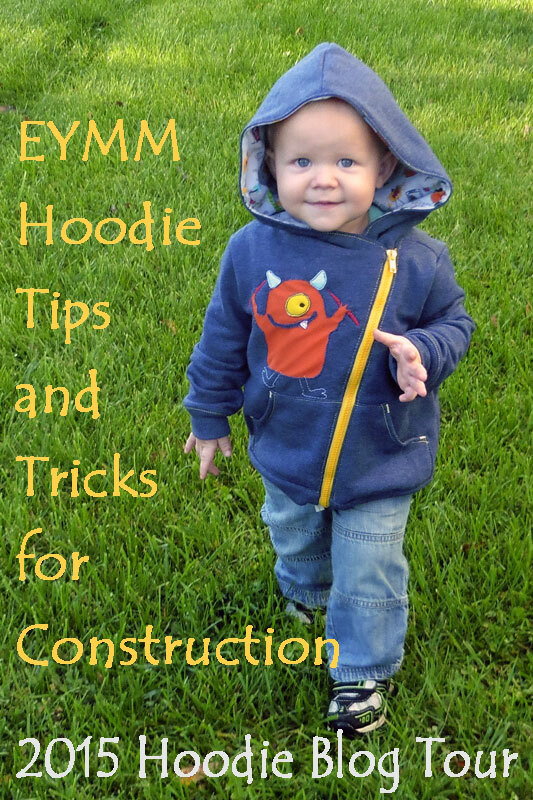 My 2-year-old’s new hoodie debuted last weekend, when I wrote some tips and tricks (and made a couple video tutorials!!) 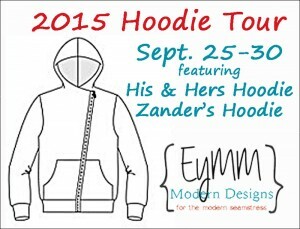 for constructing the Zander’s Hoodie and the His & Hers Hoodie. 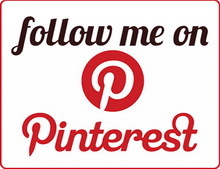 Click here or on the picture to check out that post. 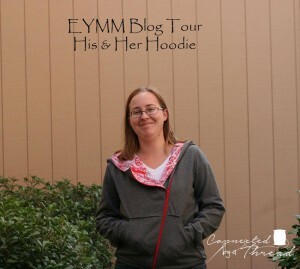 I’m still loving my His & Hers Asymmetrical Hoodie from last fall. More details about it here. I wanted to get a cute picture of my five kids and I wearing our asymmetrical hoodies, so I talked hubby into running the camera and got them all outside last evening. 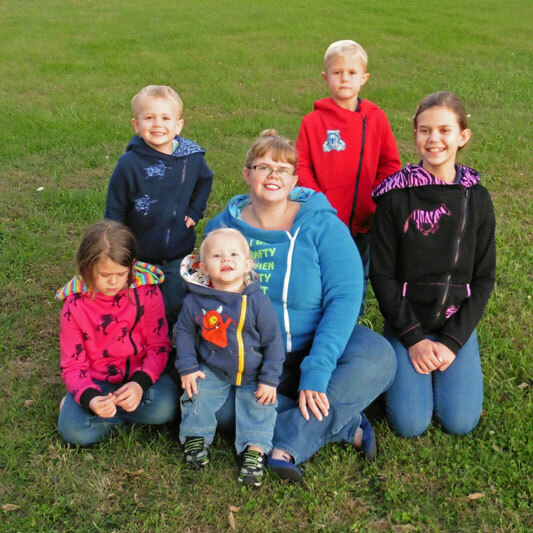 Unfortunately, between kids’ shenanigans and hubby’s lack of camera skills, I didn’t end up with any in-focus pictures in which all kids were paying attention. This is the best we got! 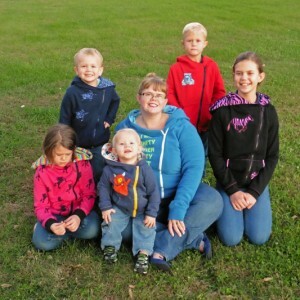 Ah, well … that’s real life for ya! 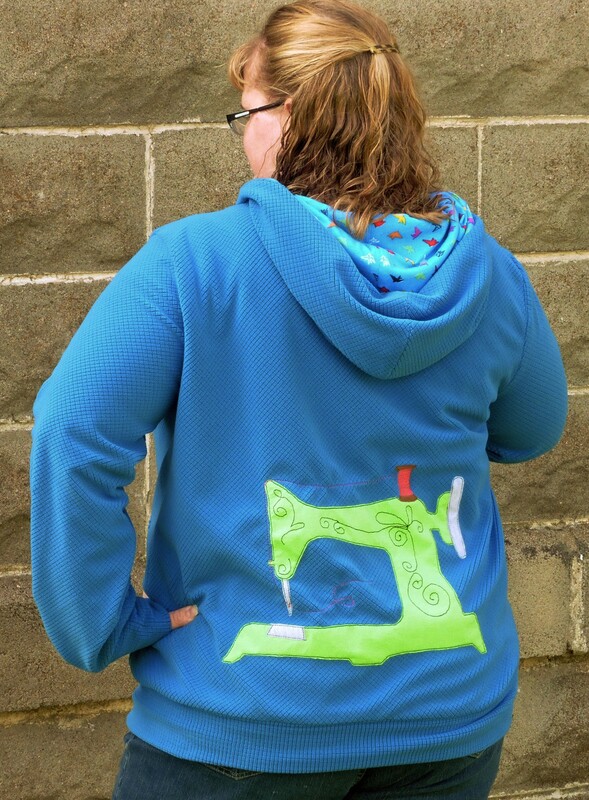 If you missed any of the 2015 Hoodie Blog Tour posts, click the pictures below to check out all the hoodie inspiration these talented ladies sewed up and showed off over this past week! 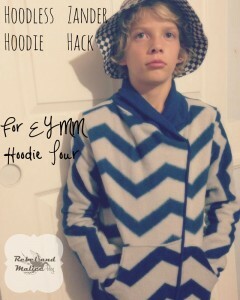 Many of them are giving away a copy of the hoodie pattern on their blog!! 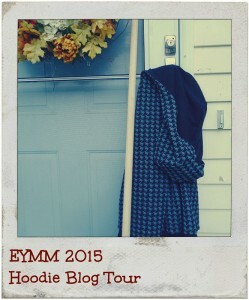 Hop over to the EYMM shop and use code FALLHOODIES2015 to save 50% on either hoodie pattern! Coupon is good for Zander’s Hoodie & Hooded Vest (newborn-18tween) or His & Hers Hoodie & Hooded Vest (adult XS-5XL) and expires 11:59pm PST on Sept. 30.